On Easter Monday we were feeling a bit restless, so Susu, Sandra and myself (the 3 S's!) took a little trip down to the Dandenongs. A long drive works up a big appetite, so we started off with lunch, at Pie in the Sky. See what I mean? The people facing the left are waiting for take-away, the people on the right are waiting for a table. Sandra had (gasp!) 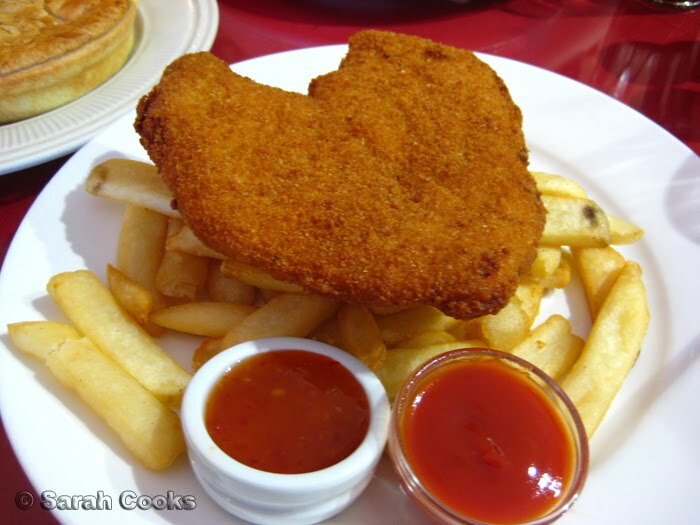 a chicken schnitzel (minus the salad, plus sweet chilli sauce). The chicken was thick and the crumbs were crispy, not greasy. A good schnitzel! 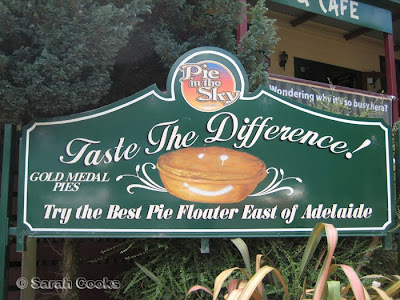 The pies are divided into "Aussie Meat Pies" and gourmet, with the gourmet ones costing 1 dollar more. Hehe, this picture, with its lack of colour and huge pile of chips reminds me of a story that Ricky Gervais tells in his Animals stand-up show, about a morbidly obese woman who ate 10 pie & chips a day. How did she do it? We were struggling with just one!! 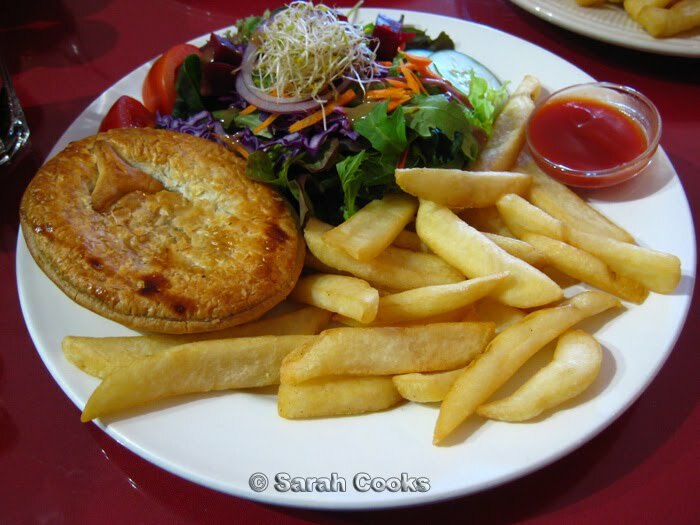 I'm glad I got the salad with my pie, not because it's healthier (haha! ), but because I needed something light on that plate full of stodge. 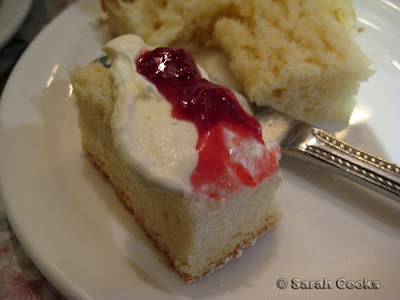 The pastry was light and flaky, and the filling was tasty and had good texture. It had decent sized pieces of kidney in it too, which I loved! 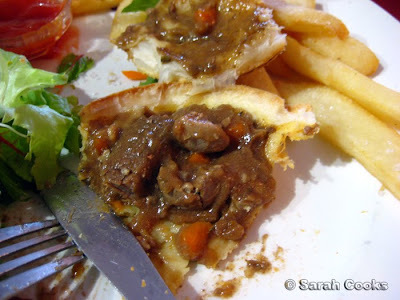 I had a small taste of Su's mushroom pie, and the gravy tasted totally different. It's interesting to see that they don't use the same sauce for each pie. The chips, as you can see, were the thick steakhouse style, and were soggy. SCORE! I love soggy chips! I'm sure I can't be the only one who prefers fat soggy chips to french fries, right guys? After we rolled out of Pie in the Sky, we drove across to Sassafrass, and had a walk around all the shops, before heading to Miss Marples! Being a long weekend, Miss Marples was crazy busy! When we got there at 3, they said we couldn't get a table until 4:15. D'oh! Su put our names down, and we started waiting. 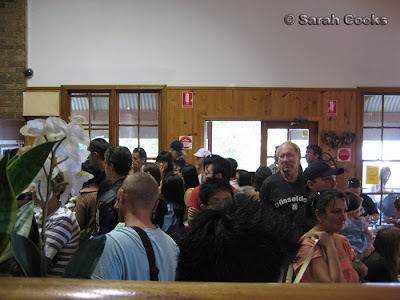 We almost decided to go home, but Su figured that lots of people who'd put their names down wouldn't bother waiting the whole time, so we'd probably get in a little earlier. She also did a bit of schmoozing, saying to the waitress, "We know you're really busy, but if anyone before us cancels we'll just be waiting outside". We waited about 10 minutes in total before they called us in. Good work Su!!! Su and I shared scones (one plain, one fruit), and a pot of Yorkshire Gold tea. I know these scones look like sponge cakes and not scones, but trust me, they are scones! I assume they're cut from one big square scone out the back. Oh wow, imagine how awesome that giant square scone would be! 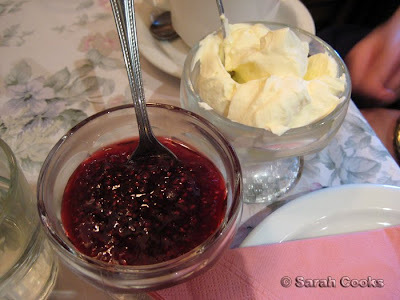 I love the generous portions of cream and jam they give. So fun! But we were so incredibly full after all of this! We wanted to go for a walk around William Rickett's sanctuary, but by the time we got there it was about to close so we had to give it a miss. I suppose a detox is in order now? 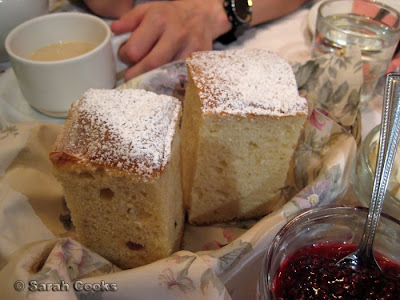 I am not sure if I can endorse the square scones. They have to be rustically cut and round for my taste. I love steak and kidney pie and I also love steak and mushroom pie. 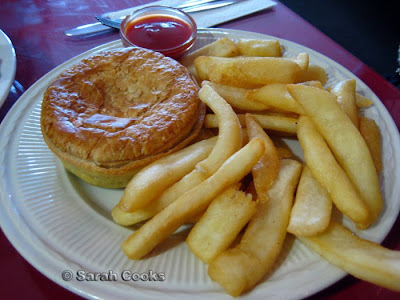 Why don't they make steak, kidney and mushroom pies. Pie in the Sky - I love it! Going to the Dandenongs is such a quintessential Melburnian daytrip; but I'm not too keen on Miss Marples, I like my scones a little crustier and less cake-like! Great minds definitely think alike, and also gluttinous minds. I can't believe I never thought of schmoozing with the waitresses to get an earlier table, duh. Now I know what to do in future. Mark - Great idea! I'd love a steak kidney and mushroom pie! Vee - I think I like Miss Marples more for the experience than for the food. We used to go there all the time when I was little! 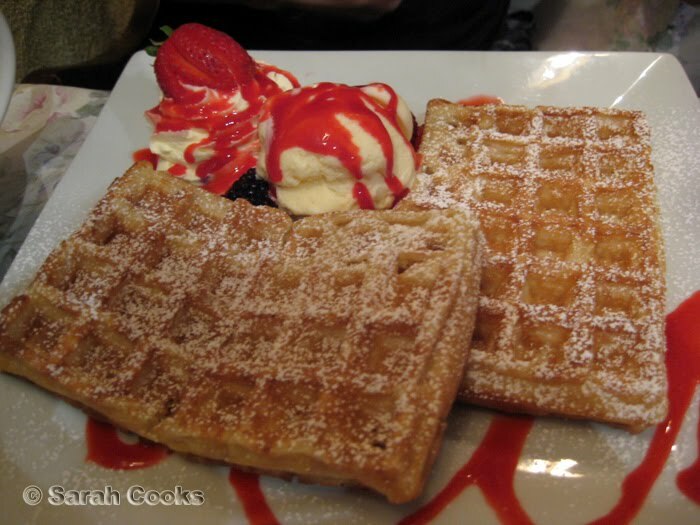 imasugarjunkie - Try going on a weekday when it's not so crazily busy! Thanh - I LOVE soggy chips. Love them! I could eat a whole bag of soggy chips. Yummmm. Yeah, Su works as a captain in a restaurant so she knows the power of the schmooze! yum...the mushroom pie looks tasty! next time try 'ripe' cafe, a couple of doors down from the old MM! aside from their menu and their cakes etc, they have yummy deli goods too, and will custom make special tasting plates upon request! Hi Leslie - It does, doesn't it?